The center piece of a 3-piece mural in downtown Portage awaits installation on Friday, June 8, 2018. Texaco, Standard, Sinclair, Gulf, Phillips 66. The friendly corner gas station. A place for travelers to break from the road as thirsty vehicles receive their fill. Clothing styles and vehicle stylings have changed through the years, but corner gas stations with their pumps remain, progressing by adding the tempting, quick conveniences inside. 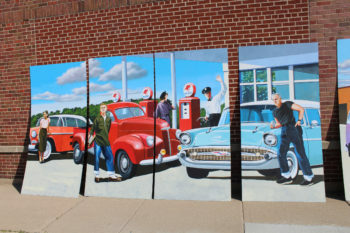 A bright new mural in downtown Portage depicts three distinct eras of people and their cars at gas stations during the 40’s, 50’s and the 60’s. Fittingly located on the NAPA Auto Parts building at 125 E. Edgewater St., the three-piece mural was painted by artist Kelly Meredith, who also painted the mural on the east wall of Wilz Hometown Pharmacy in 2017. The mural is the sixth in the series of murals comprising the Portage Mural Project which started in 2012. Other murals are located at: Riley’s Bar and Grill, 1314 W. Wisconsin St.; DAAR Engineering, 151 E. Cook St.; 806 Silver Lake Dr.; Wilz Hometown Pharmacy, 140 E. Cook St., and another soon to be relocated to the U.S. Bank drive-up at 212 W. Edgewater St.